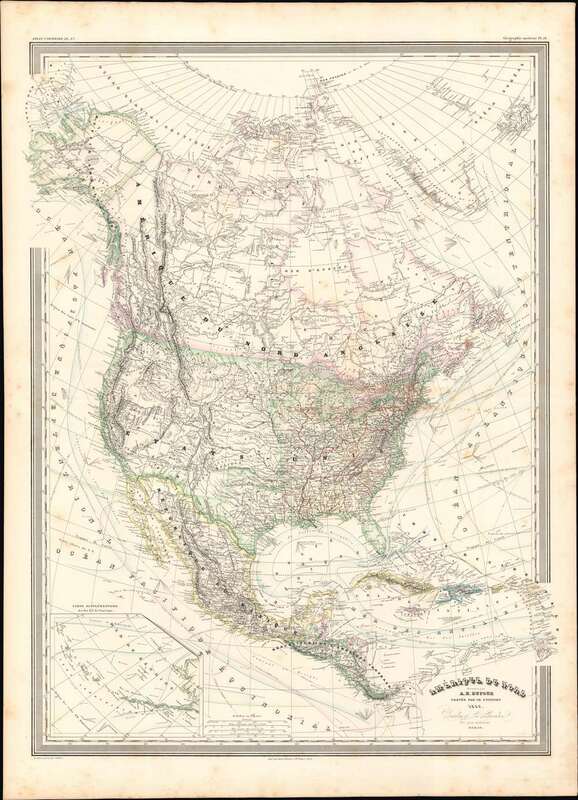 This is a finely detailed large format 1860 elephant folio map of the North America on Mercator's projection by the French cartographer A. H. Dufour. This map covers the entire continent from the Polar Ice Cap to the northern part of South America inclusive of the West Indies, Central America, Mexico, the United States, Canada and Alaska. In addition to standard political and physical data this map offers a vast wealth of cartographic information including nautical routes, currents, winds, notes on explorers, some offshore details, comments on the polar ice caps, notes on vegetation, and much more. An inset in the lower right focuses on the Aleutian Islands. The map notes several shipping lines and ocean currents. This map was prepared by Auguste-Henri Dufour and engraved by Charles Dyonette for publication plate no. 37 in Armand Le Chevalier's 1860 edition of Atlas Universel, Physique, Historique et Politique de Geographie Ancienne et Moderne.